So you have an idea to make your basement into an extra room, a games room, extra bedroom or even a gym but due to the fact that basements are underground, they are often uninhabitable due to the fact they are often damp and condensation or worst mold sets in. If you want to make use of your basement, you are going to have figure out how to keep it dry and this where cellar tanking comes in. Cellar Tanking refers to creating an impenetrable waterproofing system. This can be done in a number of ways. It can be done through the application of a waterproof coating directly to the walls, floors and sometimes the ceiling of the basement, whilst on other occasions tanking membranes for basements are used to create the barrier. Whilst this method of waterproofing does not remove water, it creates a barrier, stopping the water and moisture from seeping in. 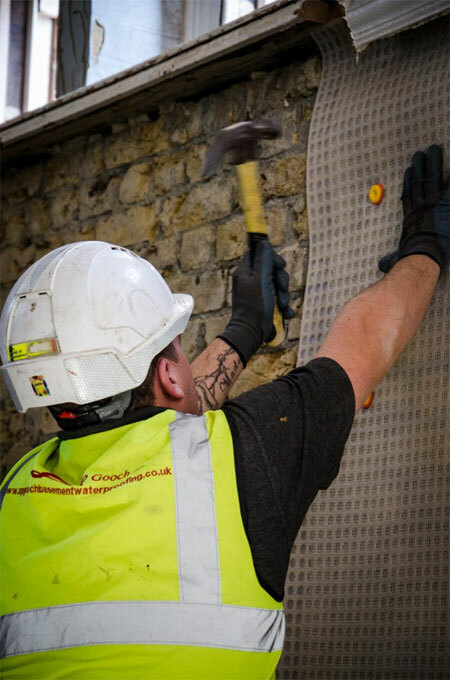 It is important that the brickwork is in a stable condition, as remember cellar & basement tanking just creates a barrier to the stop the water penetrating the basement, poor brickwork won’t be able to handle the water pressure that builds up. It is often necessary to add a sump pump to remove water that collects beneath the cellar. It is important you hire a qualified and experienced basement waterproofing contractor when tanking your basement. As you can see from our failed tanking case study, the damage that can be done by not getting this applied correctly can have devastating results. We have worked on many different types of properties that require cellar or basement tanking and would be happy to assist you in your basement project. Call us now on 01268 751299 or just fill our form on our contact us page.